Hope all have had a lovely Thanksgiving filled with stuffing and mashed potatoes…and have survived the Black Friday shopping hoopla with spirits and limbs intact. I worked the holiday at the hospital and then traveled north to my Mom's side of the family for a lovely Traditional Thanksgiving dinner. It's traditional in that we ALL have a certain dish that we are required to bring. My aunt does the meat and potatoes, my mom does the salads, my other aunt does the pie, my cousin and I have been designated the vegetables. It's probably my most favorite holiday. I'm working the weekend as well so we traveled back home today and I found a little time to work in the office while Rob and the kids went hunting. I'm hoping to get this video checked off my list so those of you that are looking for a little inspiration while you are sipping wine with your feet up, editing your Christmas gift list this will be exactly what you need. 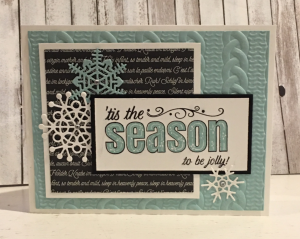 I've used the Cable Knit Embossing Folder on this card and it's one of my FAVS. 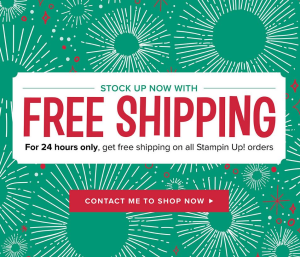 It's on sale for the Online Extravaganza with SU…10% off but just an FYI…Stampin' Up is having a FREE SHIPPING special for Monday, Nov 27th. So make out your wish lists and order all that you need on Monday! FREE SHIPPING ON MONDAY, November 27th! And if you DON'T have the cable knit folder….Get it!